Join Shelia on an underwater adventure as she dives to the depths to explore the Great Barrier Reef. Click here to play! Explore this underwater landscape for a chance to uncover some pretty amazing treasure. Shelia, your diving partner, is going to help you along as the two of you take to the water. Spin her symbol as much as possible as she is a substitute and will replace most other symbols to help you bring in more winning combinations. She will also payout a massive 8000 times your line bet if you can spin five across an active payline. While you’re swimming through the crystal waters of the reef, watch out for the exotic creatures, as they will help you in your quest for treasure. Spin two to five fish to bring in up to 2000 times your line bet. Two to five friendly dolphins will get you up to 1000 times your line bet. Snorkeling equipment, seahorses, and shells will also payout so don’t forget about them! You’re really in search of the coral. These underwater life forms are a scatter symbol and will multiply your total bet. It will also help you trigger a free game bonus feature. Dive to the depths of the ocean to explore the beauty beneath. If you’re lucky you might just discover quite a few valuable treasures. The coral acts as a scatter symbol. Spin two to five of them anywhere on the board to multiply your total bet by 1, 5, 10, or 100 respectively. 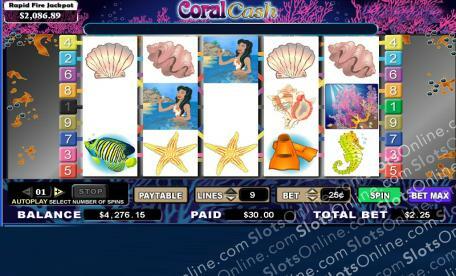 If you spin the coral on reel 1 and Shelia on reel 5, you will be awarded 15 free spins in which prizes will be tripled. Shelia the beach beauty is a wild symbol. She will replace all others, exlcuding scatters, to help you bring in more wins. She will also payout up to 8000 times your line bet if you spin one to five of he symbol on an active payline.